Acrylic Gridwall Display Trays, 12" x 4" x 2"
Dimensions: 12" x 4" x 2"
Dimensions: 23.75" x 2.5" x 1.5"
Dimensions: 11-3/4" x 2.5" x 1.5"
Acrylic Slatwall Display Trays, 24" x 8" x 4"
Dimensions: 24" x 8" x 4"
Acrylic Gridwall Display Trays, 16" x 8" x 2"
Dimensions: 16" x 8" x 2"
Gridwall display trays & bins will fit in any small accessories like books, CD & DVD, small toys, and other miscellaneous items without the fear of them falling out like our other gridwall shelves and baskets. 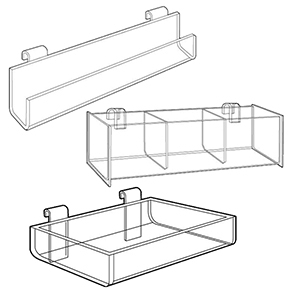 These rectangle acrlyic display trays & bins are clear, smooth and sturdy. Finally, these gridwall display trays & bins can be easily attached to gridwall panels. Gridwall display trays & bins come in many sizes. The height of these gridwall displays ranges from 2 to 4 inches. Our biggest acrylic display trays, 24 x 8 x 4 inches (WxLxH), can fit gift boxes, cub size shopping bags, boots, and any other accessories. Our biggest acrylic bins & racks for gridwall can hold small stuff animals, golf balls, bouncing balls, and other toys. American Retail Supply has been supplying retail store supplies for years and always get excellent feedback on our customer service. Give us a call for any questions or order from a LIVE rep.